I game across this interesting concept today. It was featured in Core 77’s design competition gallery, and was designed by Americans Mathieu Zastawny, Mansour Ourasanah, Tom Dooley, Peter Byar, Elysa Soffer and Mathieu Turpault. 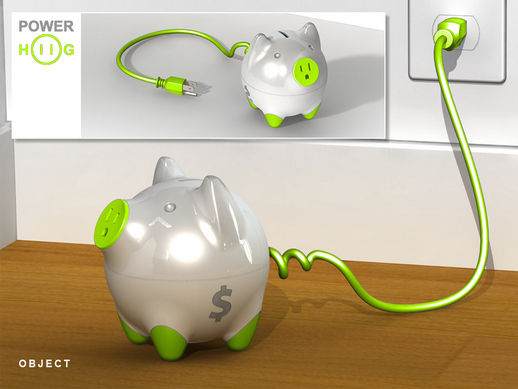 The idea is that people have to put money into the piggie bank in order to have it supply power to the device(s) connected to it. Kids would have to put money in the bank to watch television or get their daily Wii workout. I know it has a list of potential flaws longer than my… well, it’s a pretty long list. Nonetheless, it’s a pretty interesting idea for showing children the real costs associated with their electronic pastimes. And not just kids. I wonder how many adults would be surprised at the real-time costs of activities like watching television.